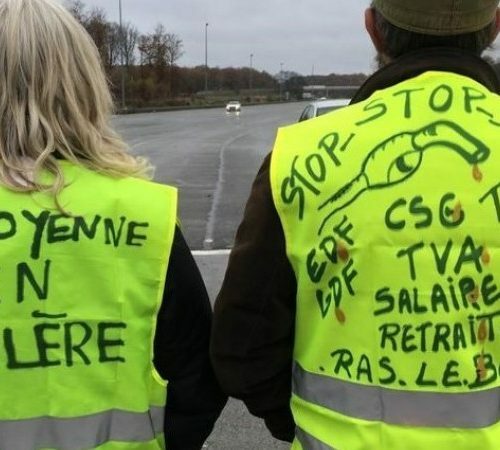 THE YELLOW VESTS EXPRESS THE ANGER OF A WHOLE PEOPLE – In mid-Nov 2018, raised taxes on fuel triggered the Yellow Vests movement. This was the little drop that caused an overflow of anger in the popular classes, those hit hardest by the increased austerity measures of the Macron’s government. The Yellow Vest (Gilet Jaunes) movement has often been able to innovate, diversify, espouse other sectors in struggle and include in its demands those of a general interest. Although wary of the parties, of the trade unions and of the whole political class, it has raised a lot of new questions concerning the future, and how to go about making society change. In only a few weeks, the scale of this movement became enormous. That was because the population supports its rebellion and sees it as legitimate. And this, in spite of social outbursts and acts of violence, and the intervention of groups of wreckers whose every act made the headlines in the medias. The Yellow Vests started with the refusal to pay extra for fuel, but they soon adopted demands for social justice, taxation justice, democratic justice, ecological justice. Their movement attracted the college students opposed to education reforms, the latter announcing yet more inequality, elitism and relegation for the young in the popular areas. Viciously hit by new taxes on their pensions, the retired people joined in too. They were followed by workers facing job losses, enterprise closures and work precariousness. The movement was reinforced when Town Halls and the communes – themselves the victims of the State’s cuts – set out registers for people to list their grievances and set out their proposals for change. The movement of the Yellow Vests grasped early that, to be heard, it had to use new types of actions and paralyse the country. The movement took aim at the economic and financial sectors, the symbols of the market economy, the people with inordinate fortunes. Obstacles were put in the way of big distribution, trade in luxury goods, the big banks, the multinationals that pollute and poison the planet. Traffic roundabouts were occupied. Toll-booths and motorways were taken over and free access to the roads was given to everyone. When Emmanuel Macron said that his fuel tax was the so-called ‘correct’ way to deal with climate change, the Yellow Vests replied that the big polluters must pay: those who use kerosene in their aeroplanes and those who use heavy oil for cruise and container ships. These people rot the air with their CO2 emissions and cause grave illnesses in the population. The Yellow Vests give a practical demonstration that you cannot have an ecological transition without a social one. Ever since he became President, Emmanuel Macron’s policy has been one of brutal reforms at all levels. Social misery is deepening, and the benefits are for the enterprises and the rich. The labour code has been scrapped, the housing subsidies have been cut, and social housing destroyed. The subsidies for employers to recruit have stopped and the social protections have been curtailed. The State of Emergency is now the new normal. Repressive immigration laws are constantly evolving. The coming reforms seek to abolish the public sector services to turn the country over to private investors. The movement of the Yellow Vests is very diverse and contradictory, but the clear aims which it expresses go well beyond those of its origins. A collective dynamic draws it towards wider vistas, the need for a better minimum wage included, the wages to rise with the cost of living, rent controls and the reinstatement of the wealth tax . It has also laid political bases in matters of democracy, in favour of citizen’s sponsored referendums, the Senate to be replaced by citizens’ assemblies and the re-founding of the Republic. The Gilet Jaunes have taken the political parties and the trade unions aback. Not greatly supported by workers and employees, the Unions fought for months against the Labour Law reform, as well as for more social justice and purchasing power. They won nothing from the government however, whilst in their own way, the Gilets Jaunes reject the capitalist system too. They do not speak on behalf of any political organisation, but they include demands in the interests of everyone in their programme. There is no doubt that the Gilets Jaunes’s movement does not come out of nothing. It comes out of the political and trade union struggles that happened and continue to happen all over the country. But in the way they function, the Gilets Jaunes display qualities that the left-wing parties and the unions do not have. The latter got themselves bogged down when they chose to ‘vote Macron against Le Pen’ in the second round of the 2017 presidential elections. This trapped them in their own contradictions. The trade unions are rather left behind because they cannot treat the Gilets Jaunes as allies. The unions are hindered in this matter by their vertical and bureaucratic way of functioning. The Gilets Jaunes have the advantage of their horizontal, democratic and solidary forms. They make their experience of power in the streets where they take everyone into account. They make decisions through majorities and popular assemblies not unlike those of Nuit Debout  in its time. Many Jaunes insist on having ‘no representatives’, and that is to avoid being utilised and being buried. Their slogan is “Power to the people, by the people, for the people”. Where spokespersons are needed, they must be persons of integrity and not come from parties or unions. In the present context, views will have to converge more. It will be a political necessity if another society is to be built, a more egalitarian society, more democratic and responsive to the needs of the majority of the population. This is going to be very complicated if the left parties and the trade unions do not change the way they operate. 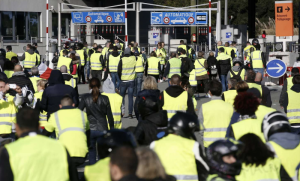 The union leaders and their apparatchiks eye the Gilet Jaunes with suspicion – but on the ground, the political, trade union and associative militants are on the side of the Gilet Jaunes. On 14 December 2018, the CGT organised a day of strikes and demonstrations. The result was not very great, but the two sides managed some contacts and exchanges between them. Three weeks after the start of the Jaunes’ movement, the leaders of the Trade Union Confederations  tried to bring out a joint declaration. There was no unanimity however. The trade union group Solidaires  refused to sign. It described the declaration as top-down and above the heads of people. In its opinion, the declaration was “a posture of union unity which does not mention the violence suffered by protestors over many years, and even worse over the last weeks” . The movement of the Gilet Jaunes is a stumbling block as far as the political parties are concerned, right and left. In the beginning, the extreme-right tried to penetrate the Jaunes with small nationalist, racist and xenophobic groups. These groups petered out, however, when the movement started opposing them and adopted demands for social justice and a minimum wage rise. There are now attempts to create lists of Gilet Jaunes for the European Elections, but this is unlikely to happen seeing how the people concerned no longer vote, or never did. And in an election where abstentions are regularly very high. This looks more like an attempt at dispersing and dividing the movement. The MPs of the left parties (Communist Party, France Insoumise and Socialist Party) brought up a no-confidence motion against the government because of its rupture with the population. The motion was lost, but the political crisis for Macron and his government is immense. There have been left-wing attempts at opening European Elections lists to the Gilets Jaunes, but this seems utopian in the present conditions. The divisions between the different camps are too great. They can even be opposed to each other on the question of Europe. There is a dispersion, each one creating their own list. Emmanuel Macron was the one to keep saying that the wealth tax (ISF) was not about to come back. Under the pressure of the Jaunes, however, and after several days of a deafening silence on his part, he appeared  on primetime television to announce measures to improve purchasing power  and hold a Great National Debate  between January and March 2019. The measures he announced are incredibly cynical and can only elicit more anger from the movement. Out of the 100 Euros that will top-up to the minimum wage (Smic) none of it will come from the employers. It will all be paid by ‘the country’, i.e. our taxes! It wont be a proper Smic raise either, because it will be a means-tested Premium of Activity form of social aid  . Not everyone will qualify, and it won’t pay the State pension stamps. For the pensioners, those with monthly payments below 2,000 Euros will be exempt from the 2019 increase in CSG . The slight rise in pensions foreseen for 2019 and 2020 should be 0.3%, but with inflation already around 1.6%, the very much hoped-for increase in purchasing power is not round the corner! And so Emmanuel Macron has not changed his spots: enterprises will not be asked for any effort. They will be given some new gifts instead: they will get tax credits  and new exonerations of social contributions – to the tune of some 40 billion Euros. These fiscal gifts were subject to conditions, like the creation of jobs, but where are these? All we see is sackings every day and everywhere, fabulous profits for the CAC 40 companies  (above 93 billion Euros in 2017), corruption and embezzlements flourishing at all levels. Capital continues to fly abroad, never mind the abolition of the wealth tax ISF. It is all a great imposture! Overtime hours will go free of taxes and charges, and a bonus – that could be as high as 1,000 Euros – might be paid to the workers of any enterprise by the bosses who choose to do so! Some big multinationals have already said what they think: they will not pay any bonus. This started immediate strike movements, as at Apple  which has just announced it made millions in profits bound for shareholders’ pockets only. Beyond the dismantlement of the public services announced in his CAP 2022 project , Macron has no plan to improve the conditions of those who work there. Faced with his project, the police demanded an immediate wage rise and back-payment for extra hours worked and that the State forgot about for months. Macron complied very rapidly, seeing how much he needs police support and presence, for the use of their weapons against the Jaunes on all fronts, and detain the Jaunes by the thousands, never mind that all they wanted was to express themselves peacefully. Macron meted against them unprecedented levels of repression which was rolled out all over France, and notably in Paris . The idea was to silence the protestors and frighten those wanting to hold their ground. The capitalist system is in full decomposition. The Great Debate announces a wish to retake the situation in hand, to bring back ‘order’ and avoid above all to discuss the demands put forward by the Gilets Jaunes. You feel this in the hardening of the tone in the media against them, particularly as the Jaunes have announced their intention to pursue the struggle to the end, to the full satisfaction of their demands that is, which include Macron’s resignation. They are ready to spend the year’s end in the places where they fight, alongside those whom they call their new family. The Great National Debate is supposed to deal with several themes like: ecological transition, taxation, the organisation of the State, democracy and citizenship, immigration. The way this will be organised and rolled out is still vague. When this President of the Republic has told you, from day one, that he will not change anything in his action plans, you are allowed to doubt the aim of his Great Debate and what to expect from it! Particularly if the consultations take no account of what people say, show contempt for people instead, and the President forging ahead with reforms at all costs behind phrases like “My only concern is you”! 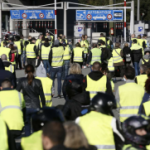 The movement of the Gilet Jaunes inspires followers abroad – in several countries in Europe, as in Belgium, Germany and Spain, and even all the way to Israel, Turkey and Egypt. It expresses the level of repudiation of misery. 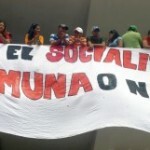 It expresses the need for a just distribution of the riches so that everyone can live in dignity. It is difficult to foresee what such a movement will become, or what changes it will bring to France and to Europe. Out of this struggle, one thing is certain to come out : From now on, nothing will be like before. This ‘wealth tax’ was called ISF– ‘Solidarity Tax on Wealth’ (impôt solidarité fortune). It applied to persons owning assets worth over 1.3 million Euros in any year. It was abolished by Macron in October 2017 (and replaced by a flat rate tax on capital gain). In December 2018, Bruno Le Maire (Finance Minister) said that his government was not going to reinstate ISF. 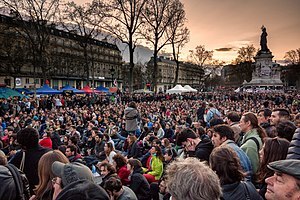 Nuit Debout was a social movement of protest in 2016 against the reform of the Labour Laws (also called the ‘El Khomri Bill’). 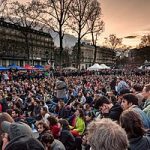 Nuit Debout had similarities with the movements of Podemos and 15M in Spain, as well as with the movement Occupy in the US and Britain. 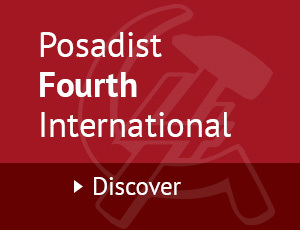 The five main Trade Union Confederationsin France are: CGT, CFDT, FO, CFC-CGC and CNT. There are smaller others. Solidaires Unitaires Democratiques, is a Trade Union Centre in France created in 1981 through the regrouping of 10 autonomous Trade Unions and others. This includes increasing the minimum wage by 100 Euros a month, the cancellation of tax on overtime, and on pensions below £2,000 a month. Employers, if they are willing, are invited to give a Christmas tax-free bonus to their workers. The Premium of Activity is a payment to a worker. It is formed of the RSA – a subsidy for returning to work without loss of state benefits (for those over the age of 25) – and of the PPE, a working tax credit to supplement low incomes. The CSG is the Contribution Sociale Généralisée. It is a tax on pensions. Created in 1991 and upgraded in 2018-19, it is used to finance Social Security and Unemployment Pay. In the past, this tax used to be raised from salaries. Incentives to allow deductions from what a company owes to the State in tax. CAC means Cotation Assistée en Continu, a French electronically-obtained stock market index from 100 companies, out of which 40 are chosen each year to rank assets and derivative products. CAP 2022 – is ‘the Comite d’Action Publique” being set up for the ‘transformation’ of the Public Service. The documents relating to it became known through a leak in October 2017. The idea is for the State to save at least 30 billion Euros. On 1st December 2018, for instance.